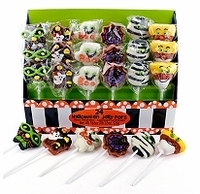 These Halloween Jelly pop suckers are so cute, a perfect Halloween candy for your parties or to hand out. 24 Halloween suckers in an assortment of spooky shapes. These are fruit flavored hand decorated suckers on a wooden stick. Halloween Designs vary from box to box. You get 6 different designs in each box of jelly pops. Each box has 24 suckers individually wrapped.